Let’s face it, you’re great. Your guests think it, your mom thinks it and we think it too! we’ve made it it really easy to use. Hmmm…this Virtual Reality stuff sounds complicated. Actually it’s complicated to make, but that’s our job, you get the easy bit. Fantastic! Then you’re good to go. A VR tour is a 360º total immersion tour, meaning that you place your users in the center of a virtual scene and they feel like they really are back in the past. It consists of various scenes in one geographical location, throughout various time periods. For example, with the Berlin Wall, the tour is centered in the area around the Berlin Wall Memorial Site (Gedenkstätte Berliner Mauer), and includes views from the West, the East and the infamous Death Strip, as well as a few extra views. Each scene is shown in the years 1968, 1975 and 1982 and is historically accurate. Will this replace tour guides? Absolutely not! The VR scenes are one component of the tour. You are the other. The idea behind the VR content is that it allows you to present the site much more historical detail. It lets people see what the site was really like, how it changed over time and how it compares with today’s views. This not only allows your users to get a first hand experience of the passage of time, it brings the site to life in a way otherwise imposible, provoking discussion and aiding learning. At each step you will be there to guide you guests, to answer their questions and to entertain them with your stories. 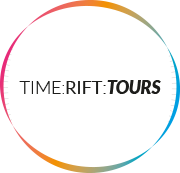 VR is just an amazing tool to help you deliver world class tours! Not to mention, ensuring your guests never forget your tours! So how dos it actually work? The tours are centred around our content management platform, the brains of the operation. This platform holds all the content you need for a tour and is really simple to operate. Can you drag things and drop them? Then it’s no problem for you! As a tour guide, you get your own control app that runs from your mobile phone and allows you to control the tour, live. Think of it as an incredible laser pointer for VR – changing from one scene to the next and highlighting various elements inside the simulation to help explain the site to your guests. Finally, we have hooked up a fancy gadget called a Monetization Engine. Although it sounds complicated, it works in the background like a virtual bookkeeper letting you know how many tours you deliver and how much you owe for each tour. It will also give you lots of other stats about your users helping you to improve your tours! The good thing is, we bill you after you have given the tour so you only pay for what you use. Neat, right? We admit that at TimeRiftTours, we are a bit geeky and love working with technology. We also admit that most people are not like this and like their technology to be as powerful as a sumo wrestler whilst remaining as simple as possible to use. We hear ya! So for this reason, we designed the platform to be as easy as drag and drop. Once you login, you can access each scene from your tour and by simply dragging elements on top of it (and dropping them there), you can add visual tags inside each 3D scene. We see this as a really useful tool for highlighting landmarks within the VR scene so that you users know exactly what you are describing. You can also add text and video if you like. Pretty cool right? Using the control app, you can then activate these elements (with the push of a button) and they apear before your guests eyes in the VR world. And it really is as easy as that. If you don’t believe us – get in touch using the form on the right and we will be happy to give you a demo. At the minute we are working on the beta version so we haven’t finalised the prices yet. Get in touch with us and we can tell you more. The question is, how eager are you to position yourself as no1 in the industry and offer the hottest product around.? We are currently running trials with the product at the minute – if you want to try it out, contact us to see how we can offer you an exclusive beta test. It’s a techy way of saying “a private test before anyone else gets to use it”. That’s why we added the contact form. Drop us a line and we will try our best to help you out. We work hard to ensure our content is not only mind-blowing in concept, but also as historically accurate as possible. To do this we form partnerships with leading institutions to gain access to historical documentation. We have even been award prizes for our efforts! We were also lucky enough to try the new virtual reality experience for the wall, which really brought the whole thing to life. Don't miss out! where the future of tours is headed!! I had the chance to the Wall Memorial on Bernauer Str. with these guys a couple weeks ago and check out their Virtual Reality experience, getting an incredible and very real-feeling look into the past and what it was like to stand on the death strip back when it was as terrifying as its name suggests! It really was an incredible experience to be able to physically see what the border looked like throughout the varying years of the wall's existence, as opposed to having to imagine it, or rely on photographs. I would definitely recommend anyone in Berlin and interested in the history of the Cold War and the Berlin Wall to check out When in Berlin and do the virtual reality tour, you won't be disappointed! Everything was great. Gave some insightful information as the images were flipping to educate me on what I was seeing. Keep developing. This is amazing!